Three hotels have proven once again that they are Cleveland’s hospitality “gems,” according to AAA East Central. The Ritz-Carlton, Cleveland; InterContinental Hotel Cleveland; and Metropolitan at the 9, Autograph Collection have earned the AAA Four Diamond Award for excellent service, and opulent décor. 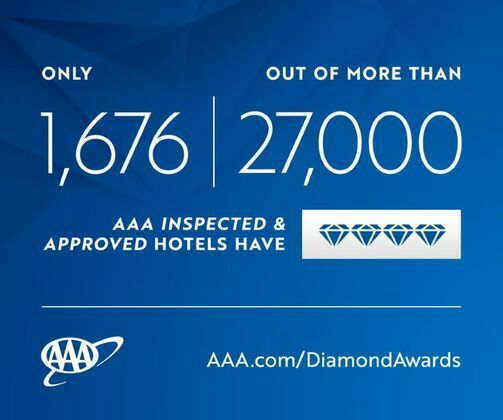 Hotels at the Four Diamond level, just 6.1 percent of AAA Inspected & Approved hotels, are an exclusive group. They must be refined and stylish with upscale physical attributes, extensive amenities and a high degree of hospitality, service and attention to detail. The Ritz-Carlton, Cleveland, 1515 West Third Street, a Four Diamond hotel that has maintained this celebrated designation consecutively since 1991. This service-oriented hotel employs a discreetly attentive staff and offers large, elegant rooms furnished with large work spaces, posh bedding, and marble tiled bathrooms. A concierge level is available featuring complimentary food and beverages throughout the day. InterContinental Hotel Cleveland, 9801 Carnegie Avenue, a Four Diamond hotel that has maintained this celebrated designation consecutively since 2003. Guest rooms are spacious with a sedate, white and taupe decor, comfortable bedding and a large desk; most have oversize windows that let in lots of light. The lobby's high ceilings, dark tones and floral arrangements provide a welcoming first impression. Be sure to check out the floor mosaic at the entrance; it's a map of the world. Metropolitan at the 9, Autograph Collection, 2017 E. 9th Street, Cleveland, has maintained it’s Four Diamond designation consecutively since 2016. This hotel features bold, glamorous decor that is thoroughly modern and just a bit saucy. A must-see is the basement-level Vault lounge: a dark and moody speakeasy with original bank vault doors. The rooftop cafe and lounge, open in summer, offers terrific views of the city. These establishments are part of a select group of hotels in North America. This year, there are 1,676 Four Diamond hotels. For more than 80 years, AAA has used professional inspectors to conduct anonymous, in-person property evaluations. AAA offers the only rating system using comprehensive, on-site professional hotel and restaurant evaluations using published guidelines weighted by member priorities. With a far greater inventory than any other rating entity, AAA’s rating system covers the United States, Canada, Mexico and the Caribbean. To see the complete lists of 2018 AAA Four and Five Diamond Hotels, visit AAA.com/DiamondAwards. To see which cities and states have the most award winners, see AAA Four and Five Diamond Hotel Facts. Travelers can find Diamond Rated establishments and inspector insight in AAA’s trip planning products: the online TripTik Travel Planner mapping and routing tool, searchable online AAA Travel Guides and AAA TourBook guides available to members at AAA offices.